Time to take some TIME OUT and join in the latest challenge at TIME OUT Challenges. Valentine's Day with the Optional Twist of Hearts. As always in our theme challenges there is a prize on offer and this time we are happy to welcome back STAMPlorations as our generous sponsor. -If you twist along with us and use hearts in your project you could win a $15 gift voucher for STAMPlorations . -Or leave a comment here on the stamplorations post to be in a for chance of winning a stencil pack from stamplorations (chosen randomly). Our Guest Designer this week is Valentyna who makes the most wonderful cards. Check out what she and the rest of her DT have made here to inspire you. Now go and take some time out and join in, can't wait to see what you create. I am going to enter this into Fusion-the hearts from the photo and my card is a loose interpretation of the sketch replacing one of the shapes with a sentiment. Oh I love how you stamped the heart slightly off the page and over the sentiment. Gorgeous! Love that you played along with us at Fusion too! Super stunning and vibrant Sandie - you're rockin these challenges. Beautiful, Sandie! 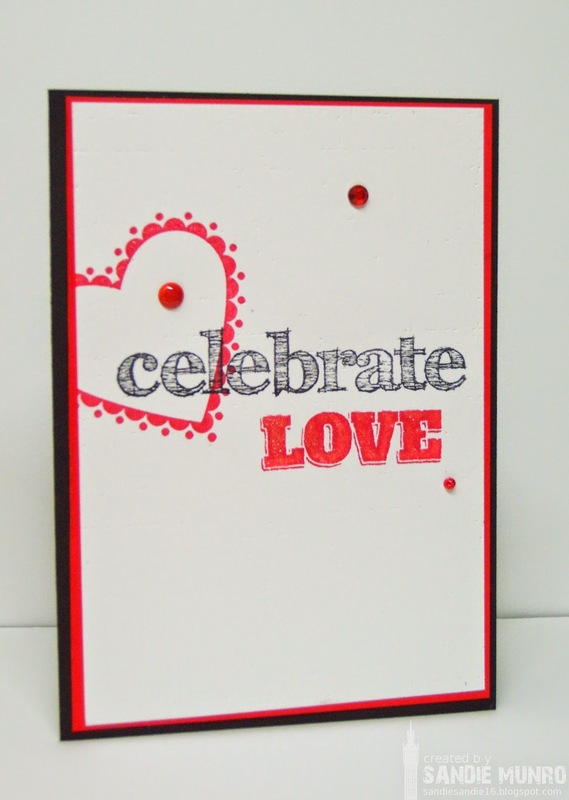 Love you stamp/heart connection and vibrant splash of colours on white! Every bit beautiful... but I LOve the sketchy celebrate! Sandie a gorgeous Valentine card! Thank you so much for sharing with us at the Card Concept! A beautiful Sandie card - CAS at its best! Lovely CAS card! Thanks for joining in at STAMPlorations! I love how you stamped the heart going over the edge of the paper, it has a really nice effect! Graphic gorgeous, Sandie! 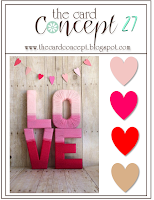 The outline heart, the bold sentiments...I'm feeling the love emanating from this oh-so-pretty card! Simply beautiful! Love the offset heart and great senitments! Beautiful, Sandie! I love this red, black and white design! Stunning CAS card! Thanks for joining us at the Take It Make It Challenge. Sweet Valentine's Day card, just adorable. This is incredible Sandie and your red ink matches your red trim so perfectly!!! So chic and graphically hip, Sandie! Thank you for sharing your creation with The Card Concept! What a wonderful card...love your stamping! Love this partially stamped heart combined with the awesome font of the sentiment! Aww. Wonderful CAS Sandie creation! Thanks for joining us at STAMPlorations this month.